Copies of The Church and the Land normally ship within 3 business days. 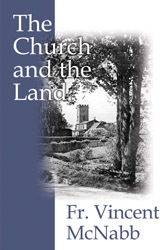 The Church and the Land is a collection of essays and articles by England's famous Dominican Distributist. De facto "chaplain" to the Distributists and the Distributist movement, Fr. McNabb was in many ways the most passionate and fervent of those seeking reform of economic life in the name of truly human values. In over 40 short essays, Fr. McNabb tackles subjects as diverse and yet unified as industrialism, morality and economics, working conditions, and the role of the state in shaping and defending the proper economic conditions. Fr. McNabb's is a common and yet unique voice within the Distributist tradition, for he represents the voice of the Church, with its characteristic concern for morality and the salvation of souls, in economic as well as all other aspects of man's daily life. Originally published: London, 1926. IHS Press is pleased to present a new Preface to this edition by Dr. William Fahey. William Fahey is Assistant Professor at Christendom College, where he is also the Chairman of the Classical and Early Christian Studies Department. He received his M. Phil. at The University of St. Andrews, Scotland, and his doctorate in Early Christian Studies at The Catholic University of America. Dr. Fahey has contributed articles to The Encyclopaedia of American Conservatism (Wilmington, D.E. : ISI Publications) and essays to Vetus Doctrina: Studies in Early Christianity and its Medieval Tradition in Honor of Fredric W. Schlatter, S.J. (New York: Peter Lang, 1999) and Duty and Responsibility (Grand Rapids: The Acton Institute, 1995). Don't miss this milestone event of Catholic publishing. McNabb back in print after over 60 years!